Was it St Kevin’s Abode, now Camden St? Another saint connected with the diocese of Dublin, St Kevin, is also to be removed from his ancient location in Camden Street. Port Caoimhin will cease to exist and will become Sráid Camden. The loss to local history of these names is immeasurable. If Camden (Street) was in fact derived from St Kevin or Caoimhin (earlier Caeimhghin), one would expect to find direct evidence of this. Can Mr Garry provide us with examples of this ancient place-name Port Chaoimhghin from which Camden Street mystically emerged about 1778? The “origin” of a lot of these alternative Gaelic names, Ó Cearbhaill says is an over-zealous avoidance of the use of English names. Unfortunately there is no follow-up article to this, so the case of Garry vs Ó Cearbhaill is unresolved. Is there evidence for Port Chaoimhghin? The Historic Town Atlas lists the references to Camden Street mentioned in a series of maps and records it as Keavans Port (1673), Cavan’s Port (1709), St Kevan’s Port (1714), Keavan’s Port (1728) and St Keavan’s Port (1756) on good old Rocque. Whatever the original name, in 1778, it became Camden Street, probably as part of the overall work scheme which included the creation of Charlotte Street. Camden was yet another of Pitt’s men, he was Lord Lieutenant of Ireland seeing through the Act of Union. He didn’t get this position until 1794, so I am not clear whether Camden St is in his honour or his fathers, a man involved in the repeal of the Dependence of Ireland on Great Britain Act 1719, repealed in 1782. Whatever about the name, Camden Street has some real gems. Numerous buildings are in the city’s List of Protected Structures. One of the most notable is what is known as the Irish Nationwide building, now a convenience store and gym. This was Gorevan’s Department store, owned by draper Michael Gorevan and his brother(s). The building is by RM Butler and TJ Byrne and is dated 1925 (Casey, 2005). Gorevans store was on the street before this however, with reference to his drapers in the early 1920s in a dispute about whether drapery firms would allow their employees to join a union (Irish Times, 20 June 1920, 29 June 1921). The new building may have been prompted by compensation Gorevan received from the state (one assumes that is arising out of the Civil War), which awarded £300 for damages to the building and goods taken away. According to the 1911 Census, the Gorevans, are recorded at 1, Camden Street, hailed from Sligo, with brothers John (46), James (42), Patrick (38) and Michael (36). Also listed in this building are nine draper’s assistants, eight draper’s apprentices, a house keeper and four domestic servants. The four brothers and a significant number of staff are also recorded in 1901. Opposite is one of the oldest buildings on the street, No. 91 (Byrne’s Butchers). The unusual fan window on the top floor may be due to the building’s original design-it is proposed that it was originally a Dutch Billy. Laurence Byrne (28), butcher, appears in the 1911 Census along with his sister (25), who both lived in what was then No. 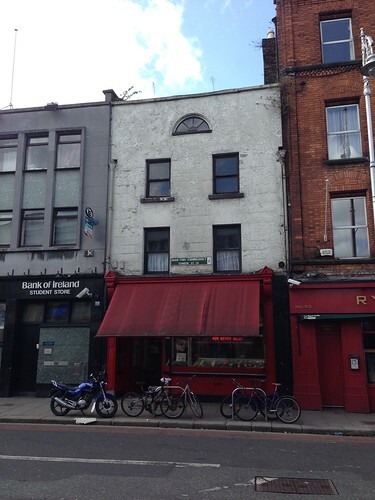 56, Camden Street. This butchers, along with McDonnell’s of Wexford St, was a Gentile butchers, catering to the local Jewish community (O’Gráda, 2006). 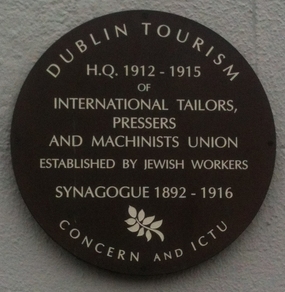 A plaque that brings together worker relations and the local Jewish community is that on Upper Camden Street, which marks the building that was between 1912 and 1916 the headquarters of the International Tailors, Pressers and Machinists Union. Despite the grand name, this was a small grouping—Census data show that about 17% of Jewish community over 40 were tailors, whereas 38% of those under 40 were, indicating that as the community aged, it was more likely to move from artisan to trader (O’Gráda, 2006). After some years of decline, Camden Street appears to be on the up again with some fashionable bars and restaurants—or should I say in Íarnród Éireann parlance: Bar Sneacanna—locating here. There’s plenty of life in the old Port yet. Cormac O’Gráda, 2006, Jewish Ireland in the age of Joyce: a socioeconomic history, Princeton University Press.